Mortie Culpepper, died 3 Nov 1968 FHM. Netta Culpeper, Daughter, F, 8, Sng, SC/SC/SC. Nellie M. Culpepper, Sister, F, 18, Sng, SC/SC/SC. Neta Mae and her husband, a Mr. Grantham, had no children. Grenda Culpepper, Daughter, F, 3, Sng, SC/SC/SC. Walter L. Culpepper Jr., White, Male, born c 1932, died 9 Oct 1933 at age 1 in Darlington Co., SC, Vol-Cert# 29-14180. WALTER L CULPEPPER, Male, White, Age: 66, Died 23 Jul 1950, Darlington Co., SC, Death Certificate: 008967. Find A Grave Memorial# 99193809. The Messenger, Hartsville, Darlington Co., SC. Obituary of William B. Culpeper, published 18 Jul 2005. Mattie (Culpepper) Toney, Sister-in-Law, F, 32, WD, md@30, TX TX TX. Edith Culpepper, Wife, F, 22, M, md @ 19, TX/TX/TX. Robert Fulton Culpepper, died 11 Dec 1961 in Denton Co., TX. Sally E. Culpepper, died 11 Apr 1955 in Bexar Co., TX. + Sarah E. Culpepper, 1861 - 1955. 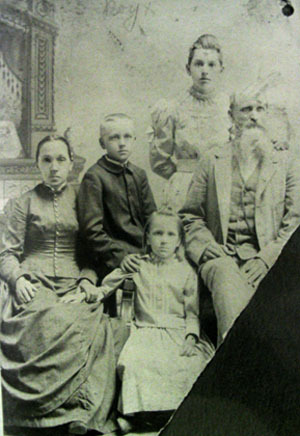 Texas Marriages: A. J. Culpepper and Sallie E. Roberts, 4 Dec 1882 (License date?). Turner W. Culpepper, Son, M, Feb 1893, 7, S, TX MS TX, At school. Oscar Roberto Culpepper, Smiley, Gonzales Co., Texas, age 32, born 11 May 1886, Caucasian, Self employed in Merchandising and Stock Farming, Nearest relative: Alice Culpepper, Wife, Smiley, Gonzales Co., Texas, Medium height, Slender build, Blue eyes, Brown hair, No disabilities. Registered 12 Sep 1918 at Gonzales Co., Texas. Howard Norris Culpepper, Derby (Frio Co.), Texas, age 27, born 20 Feb 1890 in Derby, Texas, Stock Farmer, works for his mother in Derby, Frio Co., Texas, mother is his dependent, Married, Caucasian, Medium height, Medium build, Blue eyes, Dark Brown hair, Not bald, No disabilities. Registered 5 Jun 1917 at Derby, Frio Co., Texas. Turner Wallace Culpepper, Derby (Frio Co.), Texas, age 24, born 24 Feb 1893 in Derby, Texas, Farmer, works for his mother in Derby, Frio Co., Texas, no dependents, Single, Caucasian, Tall height, Slender build, Blue eyes, Black hair, Not bald, No disabilities. Registered 5 Jun 1917 at Derby, Frio Co., Texas. Turner Culpepper, Son, M,17, S, TX MS TX, Laborer-Farm. Wilmer Culpepper, Sister-in-law, F, 20, Md, TX TX TX. Oscar Robert Culpepper, died 1 Apr 1946 in De Witt Co., TX. Oscar R. Culpepper, Brother-in-Law, M, 23, S, TX MS TX, Merchant-Gro. 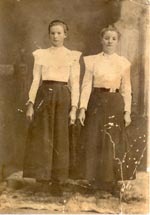 Olive Culpepper and Carroll W. Wofford, 23 Dec 1908, Lavaca Co., TX, Book VI, p. 390. Roberta Culpepper, Dau, F, 13, S, TX TX. Roberta Culpepper, Dau, F, 3 3/12, S, TX TX TX. Howard Culpeper is the father of an otherwise unidentified infant born 11 Mar 1915 in Medina Co., Texas. + Amanda T. Culpepper, 1903 - 1989. Amy Jo Culpepper, Dau, F, 1 2/12, S, TX TX TX. A. J. Culpepper, Male, born 15 Nov 1927 in Frio Co., Texas, child of Howard N. Culpepper and Amanda Taylor. Howard Norris Culpepper, Male, Single, died 30 Jul 1968 in Frio Co., TX. Amy Jo Culpepper, Female, born 6 Feb 1929 in Frio Co., Texas, child of Howard M. Culpepper and Amy Taylor. + Wilma H. Culpepper, 1899 - 1939. Alice Lillian Culpepper, Female, died 10 Jan 1985 in De Witt Co., TX. Robert Wayne Culpepper, Male, born __ 1946 in De Witt Co., Texas, child of Andrew Byron Culpepper and Alice Lillian Boethel. Andrew B. Culpepper, born 1913, white, single, 71" tall, 187 lbs., 4 years of college, retail store manager, resident of Gonzales Co., TX, ; Enlisted 25 Feb 1941 at Fort Sam Houston as a Private. Andrew B Culpepper, died 1 Feb 2000 in De Witt Co., TX. Sue Ann Culpepper, Female, born __ 1949 in De Witt Co., Texas, child of Andrew Byron Culpepper and Alice Lillie Boethel. Cathy Lynn Culpepper, Female, born __ 1950 in De Witt Co., Texas, child of Andrew Byron Culpepper and Alice Lillie Boethel. from Phelixana's Confederate pension file. Mary Etta Culpepper died 6 Apr 1963 in Titus Co., TX. Viola Culpepper, Daughter, F, Feb-1890, 10, S, TX AL AL. Vista Hunter, S-Daughter, F, 21, WS, TX MS AL. M. C. Culpepper (Mrs.), Titus Co., Aug 11 1925, 30943. Photographed* circa 1907� She was photographed circa 1907. "Pedigree Resource File," database, FamilySearch (http://familysearch.org/pal:/MM9.2.1/39VN-WM9 : accessed 2014-09-17), entry for Charles /Preston/.